Israelis Have A Love-Hate Relationship With Jerusalem : Parallels One small apartment building near the U.S. Embassy in Jerusalem is emblematic of Israelis' mixed attitudes about the city. 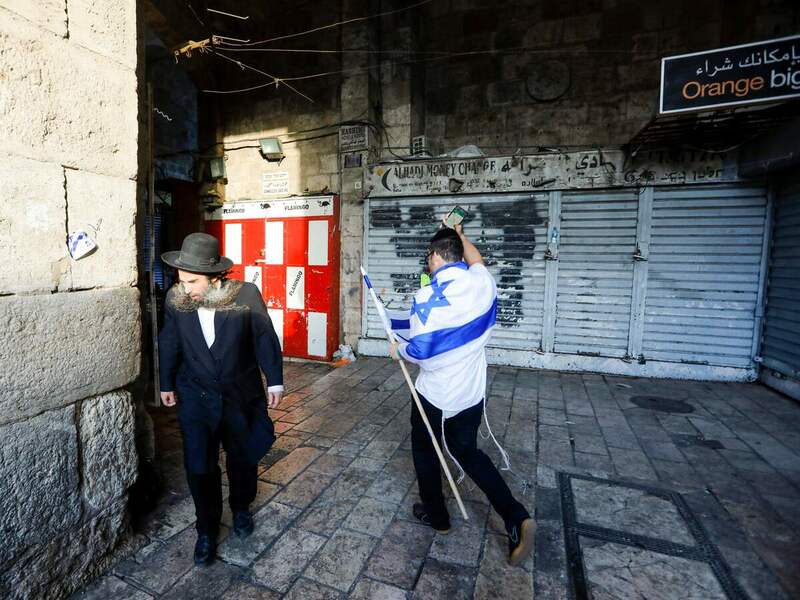 An Israeli draped in the national flag walks past an ultra-Orthodox Jewish man in Jerusalem's Old City on May 13, as Israelis marked Jerusalem Day. When President Trump moved the American Embassy from Tel Aviv, he said Jerusalem was "the capital of the Jewish people established in ancient times." The city is central in Jewish tradition. It is also revered by Christian and Muslim traditions. Palestinians rejected the embassy move, demanding their own capital in parts of the city Israel captured in 1967. Most countries do not base their embassies to Israel in the city, so as not to take sides in the dispute. 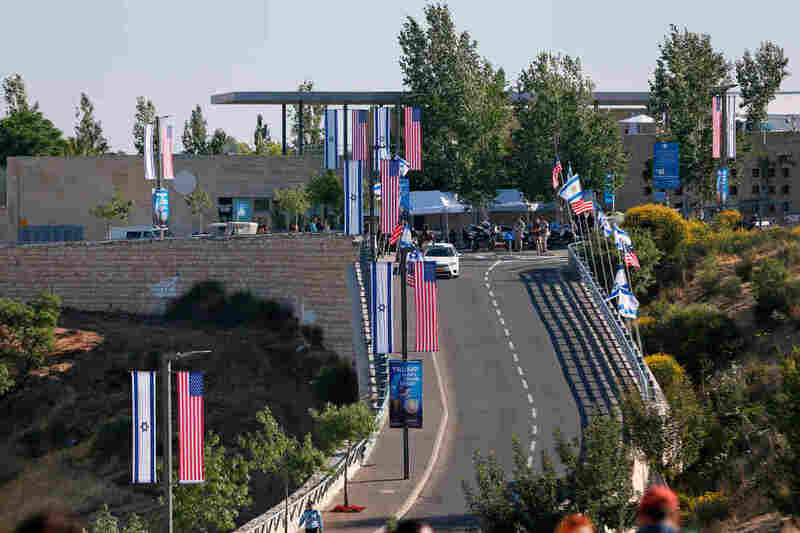 Some Israelis celebrated the U.S. Embassy move as recognition of Israel's right to sovereignty in the Jews' spiritual homeland. Some shrugged their shoulders, accepting what most Israelis believe to be a long-established fact that Jerusalem is Israel's capital. The U.S. Embassy in Jerusalem, which opened in May. But every Israeli has a strong opinion about Jerusalem as a city. It has experienced much change in the past few decades, including the trauma of violence around the Palestinian uprising of the 2000s and the growing influence of its religious Jewish community. There's a concept in Jewish tradition about the existence of two Jerusalems: Yerushalayim shel maala — the heavenly Jerusalem — and Yerushalayim shel mata — the earthly Jerusalem. It's a city of opposites, with both spiritual and physical dimensions. Like a magnet with two poles, Jerusalem both attracts and repels. 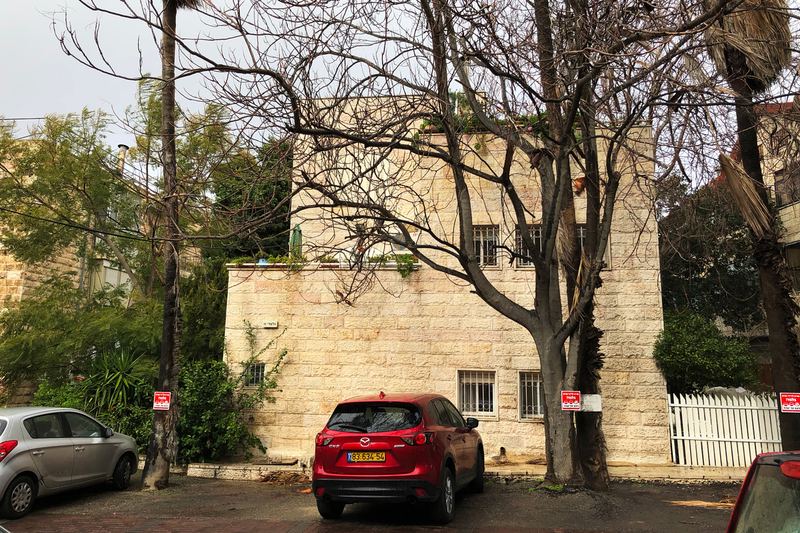 This apartment building, a short walk from the new U.S. Embassy in Jerusalem, is emblematic of Israelis' love-hate relationship with the city. On the ground floor, a religious Jewish Israeli man has moved in with his family. One floor up, a secular Jewish Israeli woman has moved out. "I always said I was born in Jerusalem, I'll die in Jerusalem and I'll be buried in Jerusalem. This was the thing I used to say always. And I don't see myself now going back," says Daphna Eilon, 64, lighting a cigarette in her new apartment in the coastal city of Tel Aviv. Eilon used to work as a TWA ticketing agent, before the airline closed down, and then as a bank employee in Jerusalem. She was the sixth generation of her family to live there. She remembers the Jerusalem of the 1990s, when there were fewer tensions between Israelis and Palestinians and her young son would play with a Palestinian boy from a nearby neighborhood. Daphna Eilon in her Tel Aviv apartment in January. She left Jerusalem because as a secular Jew, she felt pushed out. "Slowly but surely, we feel unwanted, unwelcome, un-everything," she said. "He was riding on the donkey, and my kid was on his bike, and switched. And my kid went on the donkey, and he took his bike, and they were friends. And everything was nice," Eilon says. "You wouldn't see that anymore. There's no communication. There's no relationship. I don't know. Everything went to an extreme, and I don't like the tension. So I ran away." Eilon lived through waves of Palestinian suicide bombings in the 2000s. Some of her son's friends were killed. Today, about 38 percent of Jerusalem's population is Palestinian. 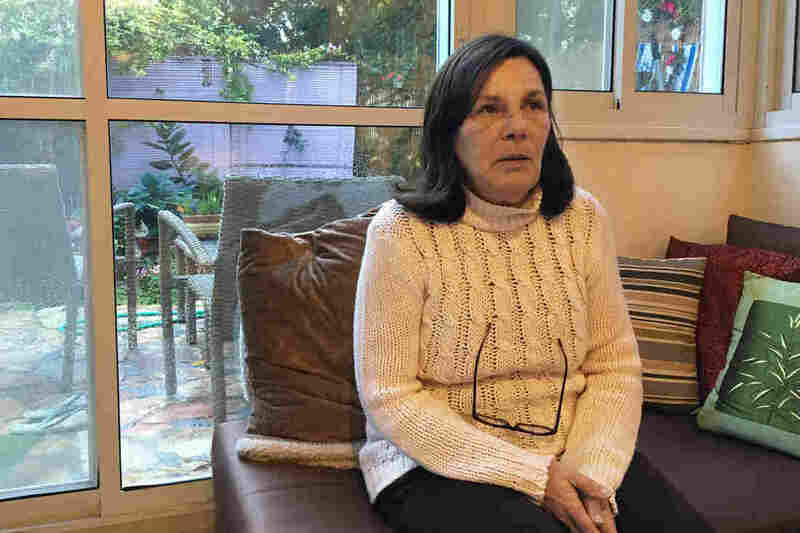 She witnessed the growth of the city's haredi, or ultra-Orthodox Jewish residents, who largely reject secular culture and live in cloistered communities centered on Torah study. Now, 34 percent of Jerusalem's residents are ultra-Orthodox, which is the highest percentage in a major Israeli city. The national average of ultra-Orthodox Jews is 9 percent, according to the Jerusalem Institute for Policy Research, an Israeli nonpartisan think tank. What Has The Unrest In Gaza Meant For Palestinians? Ultra-Orthodox Jewish neighborhoods in Jerusalem often close off public roads with barricades to prevent cars from driving through on the Sabbath, which lasts from nightfall Friday to nightfall Saturday. "If I want to go to my mother on Shabbat, I cannot take the same route I take during the week because half the roads are blocked or closed on Shabbat," Eilon says. Her son, and more than a dozen of his childhood friends, have moved an hour's drive away from Jerusalem to the Tel Aviv area. It is Israel's business hub and provides better salaries in the private sector than the mostly public sector jobs available in Jerusalem. When it comes to religion, Tel Aviv and Jerusalem are opposites. Today only 20 percent of Israelis in Jerusalem identify as nonreligious. In Tel Aviv, 67 percent of residents do. "We have the Arabs and we have the religious and we are being somehow pushed out," Eilon says of nonreligious Israelis in Jerusalem. "Slowly but surely, we feel unwanted, unwelcome, un-everything." 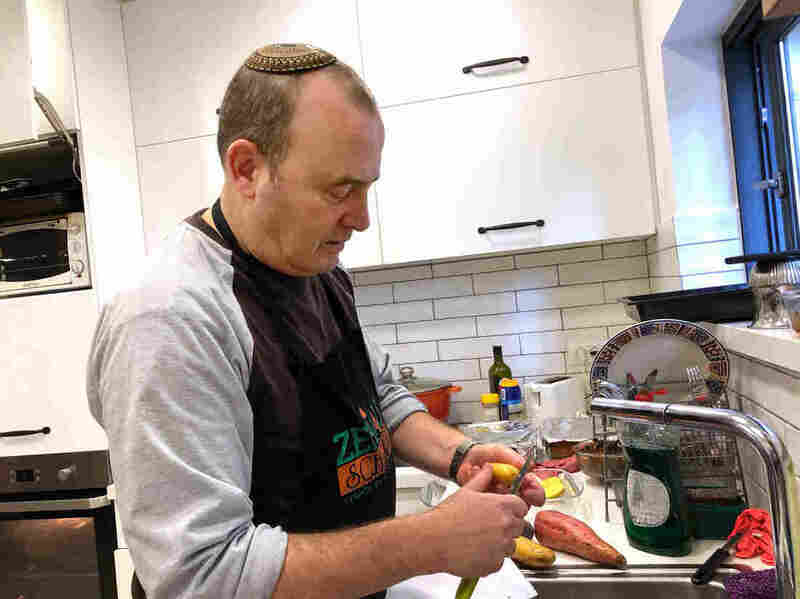 On the bottom floor of the Jerusalem apartment building, Shaike El Ami hums a Sabbath tune and prepares a large Sabbath dinner. He moved into the apartment in the past year with his family. El Ami, 59, is in love with Jerusalem, a city that his great-great-grandparents in Eastern Europe prayed about. "They all dream of Jerusalem. I have the ability to be a part of Jerusalem, building a community of Jerusalem," says El Ami. "Not just a dream. I have a mission." He belongs to Hakhel, one of a small number of progressive Orthodox synagogues in the city that allow women more leadership in prayers than is customary in Orthodox Jewish tradition. "There's something about Jerusalem that gives people the ambition and the ability to try to create a new community, to create new synagogues, to create their own style of life," says El Ami. Shaike El Ami prepares Sabbath dinner in his apartment. A member of a progressive Orthodox synagogue, he tries to create common ground between Orthodox and nonreligious Jews. He directs community centers in Jerusalem and is involved in projects to encourage Palestinians and Israelis to mingle. He also tries to create common ground between Orthodox and nonreligious Jews, a frequent source of friction in the city. As ultra-Orthodox families expand, they seek housing in parts of the city that have not traditionally been majority ultra-Orthodox. Residents of these neighborhoods often object to the newcomers, fearing their local schools will adopt a religious Jewish curriculum and that their neighbors will change the status quo of the public sphere, like closing off roads during the Sabbath. El Ami calls this dilemma the city's biggest challenge. "If we do not handle it," he says, "people will not stay in Jerusalem." There are efforts to make Jerusalem a better place to live, activists in the city say. In the past decade, Jerusalem has developed culturally, with marathons, festivals and tourism initiatives to attract Israelis from across the country, says Sharone April, the director of the Jerusalem Innovation Team, a consulting group that liaises with city officials and is sponsored by former New York City Mayor Michael Bloomberg's foundation. More coffee shops in the city are open on the Sabbath than in the past, she adds. April also says there has been an increase in first-grade enrollment in secular and modern Orthodox Jewish schools, a sign that the non-ultra-Orthodox population is holding its ground. And Jerusalem is constructing high-rise buildings at its western entrance to encourage high-tech businesses to base themselves in the city. Jerusalem's eastern sector, home to the city's Palestinians, has suffered years of neglect compared with the city's Jewish areas. The mayor has announced a multimillion-dollar initiative through the year 2023 to reduce socioeconomic gaps and promote economic development and infrastructure in that part of the city. This kind of investment has a political dimension. It is part of Israel's vow never to relinquish control over Palestinian areas of Jerusalem. But many Palestinians in the city do not accept Israeli rule on principle and want to rule themselves in an independent state with a capital in Jerusalem. Both El Ami and Eilon — from the apartment building near the U.S. Embassy — see Jerusalem as Israel's capital. But they both argue Trump's endorsement of the Israeli view isn't what the city needs most. "I can live without his declaration," says El Ami. "I am very concerned that we have any ability to make any process with the Palestinians." "Trump is not going to change the reality of Jerusalem," says Eilon. "The reality of Jerusalem will be changed by its people, and if it is not changed intentionally, it will not change for the better."